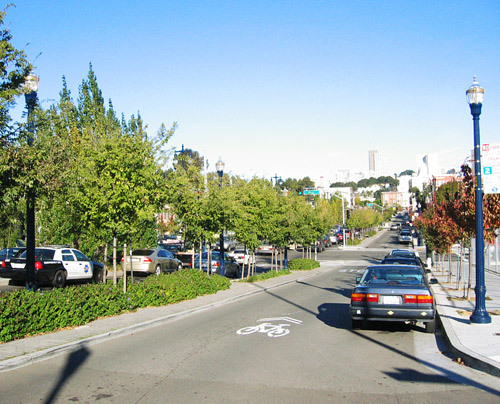 Multi-way boulevards such as Octavia Boulevard separate through travel lanes from local access lanes to simultaneously move vehicles while providing a calm, spacious pedestrian and living environment for adjacent residences. Boulevards should be considered on existing or new streets where opportunities exist for substantial street development or redevelopment and width allows. Side lanes should be designed to prioritize pedestrian use and calm traffic; they may include features such as shared public ways or raised crosswalks. Mulit-way Boulevard designs should follow the guidance of the design guidelines below. Local access lanes make travel safer and easier for through traffic and local traffic by separating these two functions. Local access lanes can be used as a shared space for local uses such as deliveries, calm residential streets for children to bike on, calm, pedestrian-priority streets, and space for local businesses to temporarily use for special events with a street closure. 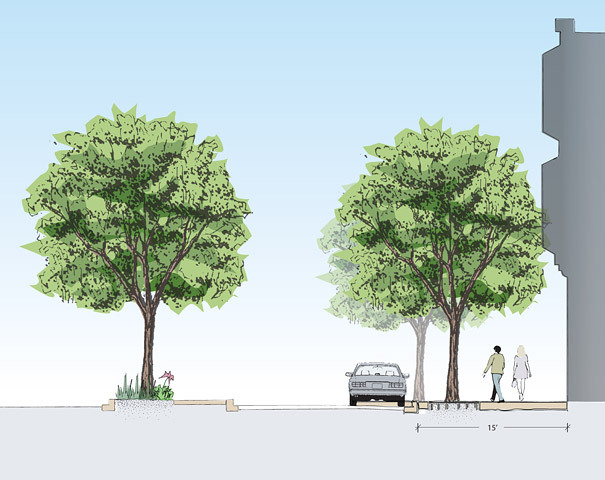 Multiple medians create the opportunity to add design features such as multiple rows of trees, special paving areas, and various areas for walking or sitting. A multi-way boulevard has local access lanes on each side of the street. A one-side boulevard involves the installation of a local access lane on only one side of the street, where there is a constrained right-of-way or a different land use context on each side of the street. Boulevard treatment should be considered for streets that serve both local traffic and significant through traffic and have sufficient right-of-way (generally more than 100 feet, though a minimum width could be as low as 86 feet). Boulevards should clearly demarcate local community space from through traffic. Community space should feature pedestrian and bicycle scale design. Medians should establish a boundary between through traffic and the neighborhood-oriented space. The preferred width for side medians is 10 feet, including 6 feet for landscaping and street trees, and 4 feet of walkable surface, even if the median is not intended for active use. In order to provide the required 14 feet of emergency access clearance in the side lanes, a mountable curb may be provided and the clear walkable surface included in the emergency access width. The community space on a multi-way boulevard may also be designed as a Shared public way, with the entire shared space at sidewalk grade. Shared space in boulevards should follow the guidelines for shared public ways in the following section. 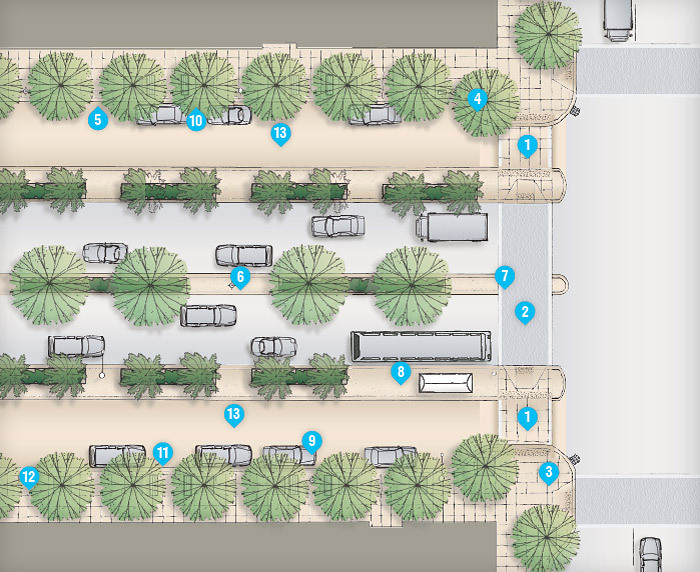 Alternative 1: Bring local access lanes back to through lanes in advance of the intersection to provide a large corner bulb-out with space for seating, landscaping and other amenities. This discourages through travel in the side access lanes. Alternative 2: Extend the side median directly to the intersection to create a pedestrian refuge island with a thumbnail at the intersection end. This allows continuous traffic flow in both the through traffic lane and in the side access lanes. On streets with transit, transit vehicles can be accommodated in the right-most through lane by placing the transit stop and amenities on the side median. Transit vehicles can also operate in the local access lane if a wide enough travel lane is provided. However, this may result in slower transit performance and increased traffic in the local access lane, which can negate the function of this area as community space.